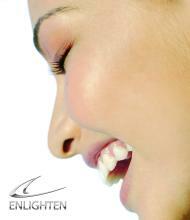 Adding to our range of whitening techniques at Confident Dental Care, we have recently introduced the new Enlighten whitening system. Teeth whitening is one of the easiest ways to enhance your looks, especially when combined with tooth straightening techniques such as the remarkable Inman Aligner. Whether you’re looking to whiten for a special event such as your wedding day, perfect your look for business meetings or just want to add a general ‘Sparkle’ to your smile, whitening at your dentist is a simple and safe solution to get that lasting effect. Many people comment that they feel many years younger after their treatment and it doesn’t even involve surgery!! Once your whitening trays have been delivered, the treatment takes 14 days, usually 14 consecutive nights and is done in the comfort of your own home. On the 15th day, you return to the practice for the final treatment which takes just 40 minutes. This new system GUARANTEES a B1 shade which we can show you if you are interested in the treatment. Take advantage of this amazing system which has featured in numerous press articles and TV makeover shows. Ask our team for more information.